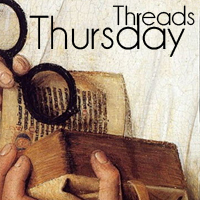 Historical Tapestry: Thursday Threads - Who would you be? Thursday Threads - Who would you be? Of all the wonderful historical fiction characters and settings there are, which historical setting would you like to be in and even which individual? I would love to be a character in the setting for Pride and Prejudice. Perhaps a fly on the wall in the library or living room with the enduring Mr Bennett. I wondered what he really thought of his beloved? I would love to be in France, as Athos' foster daughter (would he ever have a daughter). I love the days when most people consider plays, falconry, horse-riding and Latin as something required or even something to boast about. I'll opt for John of Gaunt's mistress, Katherine, the one he eventually married ! Elizabeth Bennett in Pride and Prejudice without a doubt. I wouldn't mind being a fly on the wall at the Restoration court of Charles II! Great idea Marg...can I be a servant to Nell Gwynn? Otherwise, I loved Melanie Benjamin's "The Autobiography of Mrs. Tom Thumb," so I want to hang out at Barnum's American Museum!